This sketch shows how a quantum gas microscope hones in on individual atoms in the gas. (PhysOrg.com) -- Physicists at Harvard University have, for the first time, tracked individual atoms in a gas cooled to extreme temperatures as the particles reorganized into a crystal, a process driven by quantum mechanics. The research, described this week in the journal Science, opens new possibilities for particle-by-particle study and engineering of artificial quantum materials. "Much of modern technology is driven by engineering materials with novel properties, and the bizarre world of quantum mechanics can contribute to this engineering toolbox," says Markus Greiner, an assistant professor of physics at Harvard who led the research team. "For example, quantum materials could be used to turn heat into electricity, or in cables that transport electricity very efficiently in a power grid." "The challenge in understanding the behavior of such materials is that although we have many ideas about how they might work, we lack the tools to verify these theories by looking at and manipulating these materials at the most basic atomic level," Greiner adds. "This is the problem we have set out to tackle." To circumvent the challenges of studying such materials, Greiner and his colleagues created an artificial quantum material, a cold gas of rubidium atoms moving in a lattice made of light. This pancake-shaped cloud, known as a Bose-Einstein condensate, allowed them to study the physics of quantum materials at a much larger scale, essentially simulating what happens in a real material. The physicists watched individual atoms participate in a dramatic collective transition between two different states of matter, similar to the transition that happens when water freezes into ice. But this transition was driven not by temperature, but by the researchers' manipulation of interactions between the atoms. "We counted the number of atoms at each site of the lattice," says co-author Waseem Bakr, a graduate student in Harvard's Department of Physics. "When the interactions between the atoms are weak, the number of atoms varies significantly in different sites due to uncertainty that is intrinsic to quantum mechanics. When we increase the interactions, these fluctuations vanish, and the atoms arrange into an almost perfect crystal." Such a transition from a superfluid state -- in which particles can move with no resistance -- to an insulating Mott state -- where the atoms can no longer move -- was first observed by Greiner and colleagues in 2001. 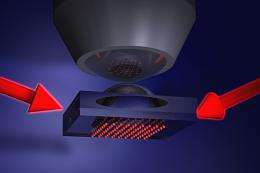 However, a quantum gas microscope developed last year by Greiner's group now allows observation of individual atoms as they undergo this transition. "This microscope is a versatile tool which should be able to shed light on many other phenomena related to quantum materials, such as magnetic materials," Greiner says. "It could even be used for computations that require enormous resources on current computers." While a simulation similar to the current experiment could, in principle, be carried out on a computer, Greiner says such an approach would quickly become infeasible for a system with more than a few dozen atoms.